Wearing gemstones can bring success, good luck, prosperity and happiness into your life. For the stones to be effective, they have to be chosen with care. The concept behind wearing gemstones is simple. The horoscope of each person has planets placed in benefic and malefic houses. The gemstones are recommended by an astrologer on basis of the placement of planets and signs in the birth chart. Gemstones normally bring excellent results however they should be worn with proper care and advice of an expert. Gemstone such as the Blue Sapphire which is ruled by Saturn is considered to have very powerful energy and may at times harm the person if it does not suit the person who wears it. The native may experience severe depression, misfortune, bad health, financial losses and it may end up aggravating his/her problems. Before wearing a gemstone, such as a Blue Sapphire, it is usually tried out or tested, by placing it under the pillow of the person who is to wear it, for a period of seven days. If no negative effects are noticed, it can then be safely worn. Generally astrologers recommend stones of the 1st house which is the lagana or the Ascendant. They also recommend stones of the planet ruling the 5th house which represents the intelligence and the 9th house which is the bhagyastana. Gemstones can be worn of the planet if it the Yogakarka in the horoscope. Yogakarka are the Dhan or wealth giving planet. Yogakarka planets are those which own a Kendra house and also a Trine house in a horoscope. The Kendra houses are 1,4,7,10 in the chart while the trine houses are 1,5,9. If a planet owns one house of Kendra and another house of Trine it is called a Yogakarka planet and its strength is only next to that of the Ascendant or Lagana. Its dasha and antardasha period generally blesses the native with luck, money, gains from others, connections with authorities or people at higher place. 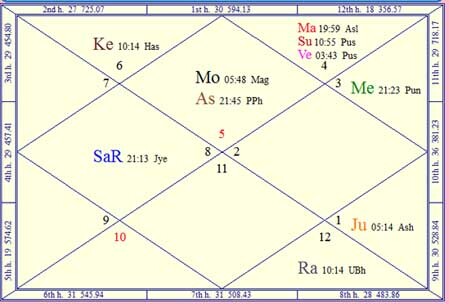 For Taurus and Libra ascendant Saturn becomes the Yogakarka planet. For Capricorn and Aquarius, Venus is the Yogakarka planet. For Cancer and Leo Mars is the Yogakarka planet. Gemstone should be avoided of planets which are debilitated in the horoscope or debilitated in Navamsha that is the D9 chart. 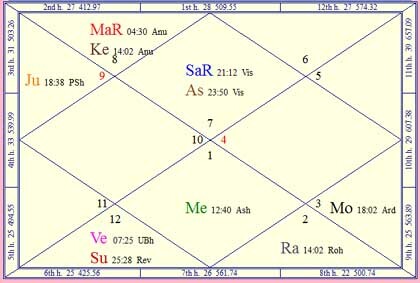 In the above Horoscope Mars is the Yogakarka planet as Scorpio and Aries sign rule the 4th and 9th house respectively. However Red Corel is strongly not recommended as Mars is in Cancer its sign of debilitation in the horoscope and placed in the 12th house. By wearing Red Corel it will strengthen Mars which would only increase the expenses the native will do on medicines, hospital visits. Therefore the native should not wear Gemstone of Mars which is Red Corel but strengthen Mars by ways of Puja / path and worshipping Lord Hanuman. In this example birth chart Saturn rules the 4th and 5th house as sign Capricorn and Aquarius are placed there. Blue Sapphire is strongly recommended as Saturn not only is the Yogakarka planet meaning Dhan giving planet but also exalted in the horoscope as it is in the sign Libra. With Yogakarka Saturn in the Lagan/ Ascendant the native will be highly focused person, determined, analytical and calculative in whatever he does. Enhancing his knowledge and house having a house will be his priority. The native will spend on learning and also a house. The native will be respectful and duty bound towards his mother. The native will do love marriage and spend openly on his beloved. 1. The correct gemstone is chosen by an expert astrologer after deep analysis of the horoscope. When a gemstone is set in a ring, rather than in a pendant, it is known to bring better results. It is important to remember that the stone should touch the skin for its energy to pass in your body. The astrologer will also recommend the metal the gemstone should be set in, such as gold or silver and also the finger the ring should be worn on. The Yellow Sapphire, Rubies, and Emeralds are set in Gold, whereas, the Blue Sapphire and the Cat’s Eye are set in Silver. 2. An auspicious day and time is chosen to wear the gemstone. The moon phase at this time should be waxing, to maximize positive benefits. These details too are suggested by the astrologer after studying the Panchang / Hindu Ephemeris. 3. Prior to wearing a gemstone, it has to be purified. The ring or the pendant, in which the gemstone is set, is soaked in unboiled milk or Ganga Jal for a few hours. This removes negativities from the stone. 4. In keeping with Vedic beliefs, life is breathed into the stone by chanting the mantras associated with the planet that rules the gemstone. These Holy mantras are given below for your reference. This is called ‘Praan Pratishthan’ which when translated means, to give it life. The ring is held in the right hand and the mantra is recited 108 times that is 1 mala. Dip the gemstone into the Ganga Jal for few hours and later dip into the Panchamrit. Panchamrit is a mixture of Ganga Jal, Honey, Fresh Milk, Curd / Yogurt, Single drop of Desi Ghee and one Tulsi / Basil leaf. Recite Mantra as given above 108 times and remember the reason why you are wearing it and also your Isht Dev or Devi and wear it with full devotion. The Authenticity of the gemstone is a must therefore you should buy from a reliable source so that you are sure that the gemstone is genuine. It should also be a natural stone; synthetically manufactured stones are decorative and offer no astrological benefits when worn. Gemstones should be lustrous and clear. Those with cracks in them often bring bad luck. Gemstones should ideally be worn on the fingers of the right hand, as this brings best results. Wearing gemstones is a great way to align yourself with the positive vibrations of beneficial planets. When correct gemstones are worn, they help bring positive changes in daily life and can bestow fame, fortune and success. Sorry, I don’t understand. For example, my asc is Twins, Ketu is in the Lord of the second house. Can I wear Cat’s eye? Thank you.